This configuration review written based on official HP Advanced Traffic Management Guide with some scenarios added to clearify topics not fuly covered in the official guide. 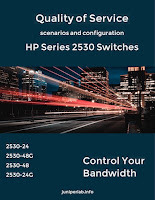 In this review you can find various configuration scenarios on QoS deployment for HP 2530 Series switches with detailed explanations how to deploy one or another QoS method/technique to achieve required results. This switch software review is intended for network administrators and support personnel who wants to depoly QoS service in low-price HP configurable switches. Let's consider another example when central Core switch connects Edge switches with running services on them. On edge switches SW1, SW2, SW3 we will be prioritizing the services traffic using DSCP policy prioritization and on core switch CoreSW the traffic will be prioritized using QoS VLAN-ID Priority with 802.1p prioritization on tagged (trunk) ports.